The mass is a relevant quantity in many physical models: masses of exotic short-lived nuclei are important for the investigation of the weak interaction and the Standard Model of particle physics, stable masses are used for the definition of natural constants . Up to now, precision mass measurements on radio nuclides are performed in Penning ion traps using the destructive Time-of-Flight-Ion Cyclotron Resonance (TOF-ICR) method . In this case, several hundred ions are needed for a single spectrum. According to a typical production rate of a few hundred ions per second and an overall efficiency of 1% it takes about an hour to record a spectrum. Production rates of superheavy ions with mass numbers in the region around 250 are remarkably lower (circa 1 ion per second). At the same time they have relative long half-lives (sometimes even in the range of seconds), which allows to apply the non-destructive FT-ICR method (see measurement principle) . This method is already used in chemistry with several hundreds of ions stored simultaneously, but has to be improved to allow for single ion detection. The measurement with single ions in the trap also reduces the frequency shift caused by image charges in the ion trap electrodes . Another improvement of the uncertainty in mass determination can be achieved by using highly charged ions, which reduces the relative uncertainty δν of the cyclotron frequency νc = qB/(2πm). Mass measurements with Penning ion traps are based on the precise determination of the cyclotron frequency νc = qB/(2πm). For this purpose, the destructive TOF-ICR method is commonly used at present. A cooled ion is stored with negligible radial kinetic energy inside the ion trap. The stored ion is excited to a well defined magnetron radius by external dipole excitation. An alternating electrical quadrupole field is applied to the typically four-fold segmented ring electrode. When the field frequency matches with the cyclotron frequency, the motion in the magnetron mode is transferred into the cyclotron mode. Since the frequency of the cyclotron mode is several orders of magnitude higher, the radial energy drastically increases. This radial energy can be measured by ejecting the ion out of the trap. The coupling of the magnetic moment of the orbital motion to the field gradient of the superconducting magnet transforms the radial energy into axial energy. Thus, the measurement of the time-of-flight towards a detector gives information about the original radial energy. By determining this time-of-flight with different excitation frequencies a spectrum can be recorded (see figure 1). The minimal time-of-flight corresponds exactly to the excitation with the cyclotron frequency of the ion. In order to improve this method, the so called Ramsey technique for quadrupole excitation has been established recently. In this case, the ion motion is not excited by a continuous quadrupole field, but by two short time-separated pulses. The resulting narrower resonances allow a more exact determination of the cyclotron frequency und thus a more precise mass determination. The experiments performed here allow in addition to the classical time-of-flight analysis the non-destructive ion detection by means of the Fourier Transform-Ion Cyclotron Resonance (FT-ICR) method. 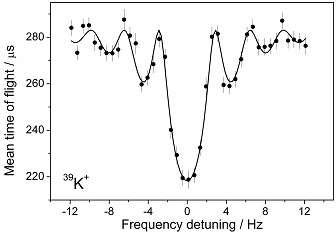 Here, the image currents induced in the ion trap electrodes by the ions are measured and the corresponding frequency spectrum is determined by Fourier transform of the time signal. Together with a calibration of the missing parameters by reference ions the necessary information for the mass determination can be extracted. However, the image currents of individual single charged ions are only in the range of several hundred Femto-Ampere (1 fA = 1E-15 A), in case of highly charged ions this number is multiplied with a factor according to the charge status. To get a good signal-to-noise ratio the detection bandwidth has to be reduced, since the thermal noise is proportional to its radix. Further noise reduction can be achieved by cooling of the electronics and the ion traps with liquid nitrogen (T = 77 K) resp. liquid helium (T = 4.2 K). The narrow-band detection circuit (Fig. 2) consists of a superconducting coil, that forms a parallel LC resonant circuit together with the unavoidable parasitic capacities of the ion trap and the feedthroughs. The quality factor, i.e. the ratio of the resonance frequency to the resonance width, has to amount several 1000 in order to guaranty a sufficient signal-to-noise ratio. The voltage drop over the resonant circuit, being proportional to the image current, is amplified and then Fourier transformed. K. Blaum, Phys. Rep. 425, 1 (2006). S. Guan et al., Int. J. Mass Spectrom. Ion Process. 146/147, 261 (1995). R.S. van Dyck et al., Phys. Rev. A 40, 6308 (1989).